Do you like giving yourself keratin treatments at home? Then make sure you’re doing it right! We often go to the salon to get hair treatments done, but what if you can do it yourself at home? That would most certainly be convenient, especially at times when you’re too busy or just can’t leave the house. One of the hair care pampering sessions you can DIY is a keratin treatment. You can definitely give yourself a keratin treatment at home and the result would be the same! But before we go into all of that, let’s talk about what it is and what it does. A keratin treatment works at repairing the damage on your hair, replacing the protein that your strands have lost due to chemical treatments, heat styling, and other damaging conditions you have exposed your tresses to. It rebuilds the damaged areas, adds shine, and eliminating frizz so your hair is more beautiful and easier to manage. Keratin treatments do wonders to the hair, offering a wide range of benefits like adding moisture to the strands that help make them soft and smooth, and making your tresses strong, shiny, and fly-away free. If you can’t make it to the salon, incorporate instead an at-home keratin treatment to your hair care routine. But of course, you gotta know how to do it correctly so you can make the most of its benefits. But before anything else, let us introduce you to our favorite product: TRESemmé Keratin Smooth Treatment Mask. If you’re going to give yourself an actual keratin treatment, make sure to maintain it with a keratin mask like this. This product help to give you an instantly smoother style and frizz control. Now, here’s a step-by-step guide to help you DIY that keratin hair treatment at home so you can give your locks a major reboot. Wash hair with a good keratin shampoo for complimentary ingredient benefits. If you have straight hair, wash twice; if you have extremely curly hair, add at least one more wash. Note: DO NOT use a conditioner. Also, make sure hair is thoroughly rinsed. 2. Massage treatment onto your hair. Towel dry hair gently but leave some moisture so hair can easily absorb the product. Coat your strands with the keratin treatment, starting from the tips going up. Stop at one inch from the scalp. Gently massage hair with the product. With the product still on your hair, comb your locks gently with a wide-tooth comb. Then let it set for thirty minutes. Rinse thoroughly to make sure there’s no product buildup left on your hair as this may cause dandruff. Blow dry hair while brushing. Once completely dry, separate hair into small sections and lock the keratin in by ironing each section thoroughly. Make sure the sections are small and thin enough so the heat is applied evenly. Keep hair dry—wait for 48 hours before washing. This is the required time to let the keratin seep into the hair and work its magic. Make sure you don’t tuck your hair behind the ears, or tie it. Keep it straight. After 48 hours, you can now wash your hair. 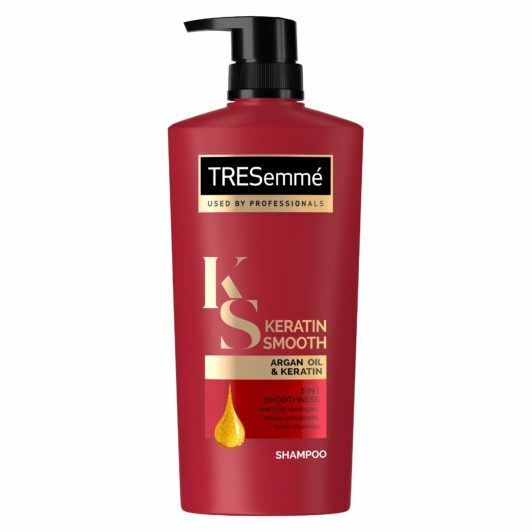 Use shampoo and conditioner (we love TRESemmé Keratin Smooth Shampoo and TRESemmé Keratin Smooth Conditioner), then blow dry. So, yes. It is possible to give yourself a keratin treatment at home. Just make sure you’re doing it right!